It is really quiet right now but I think that is probably the calm before the storm. It is 5:30am and I am going to guess that when the sun starts to rise the dogs are going to be wanting to go for a W-A-L-K, P-L-A-Y, and have treats. All the dogs in the adoption area went nuts about an hour ago because someone spending the night in the kennels got up and was walking around. I guess the dogs were protesting that they didn’t get to play too. Surprising to me is the fact that the cats and kittens have either been sleeping or are resting quietly. I haven’t heard any crying or running around their crates. Well not 100% true but that was because I keep waking up the room of cats and kittens where my former foster babies are so that I could take them out and have them with me for a bit. 3 of the kittens are being housed together and one is on its own. When I had the 3 in the office with me they were running around and playing. Chasing each other and hanging out. They were certainly having fun. So much fun that even with the video camera I couldn’t get them all at once and would have given you a headache as I tried to follow them manually. 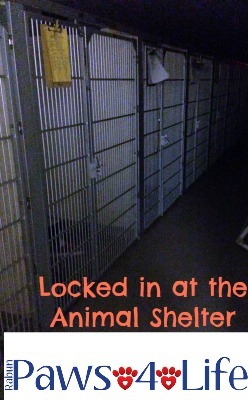 For the most part everyone at the animal shelter sleeps during the night when they are here alone. They aren’t all alone because most do have a kennel mate or two. Plus, they have their new Kuranda Beds to keep them off the floor. In the winter when it gets really cold they will likely choose to sleep directly on the floor which is heated. They heat the floors in Animal Shelters so that they can keep everything as sterile as possible even in the winter without having to have too many loads of laundry per day. At home you likely don’t clean your dog’s bedding all that often. Maybe after a rain or they played in the mud or on a specific laundry schedule but likely not daily. At Animal Shelters anything that has been with a dog or cat for the night needs to be washed and sanitized in order to keep down any transmission of disease from dog to dog or cat to cat. With so many dogs and cats in such close proximity it is vital to do everything possible to keep everyone healthy. Plus, no one wants to adopt a sick dog or cat. If it has been a while since you have washed your pets bedding take some time today to do so! An ounce of prevention… Plus clean bedding helps keep their coat looking shiny and healthy. Yep, good idea! I know my bedding was washed last week, but an entire week has gone by and my Human wants to give me a bath if it ever stops raining. A bath for me definitely means clean bed linens for this fellow! I’m enjoying all the updates Felissa and was very happy to learn about the tremendous response and the huge amount of food that’s been donated…Good work everyone! This is interesting and we do try to wash our beds regularly good tip.